Years ago during the developmental stages of the internet I was a big proponent of the web being used as a positive tool of the common person. This was way before the development of social media such as Facebook, Twitter and other basic chat boards. I felt that with the power of the internet, the average person could use the publishing tools of the web to communicate effective and positive messages without relying on the large publishing houses or fringe media platforms. Unfortunately, things did not evolve in the way I had first hoped or imagined and now we have an over abundance of arm-chair philosophers and commentators. While I still believe in every man or woman having the write to express themselves, what I have come to distain is the amount of personal attacks and abuse taking place in the name of religion, politics, fashion, science or any other topic. What has become increasing disturbing is the lack of empathy or self control which is illustrated by the high degree of name call and personal assaults. Blame this on whatever position or opinion you disagree with, the truth of the matter is, this will likely get worse before it ever gets better. So how do you debate against the person who resorts to name calling and personal attacks when they disagree with you? 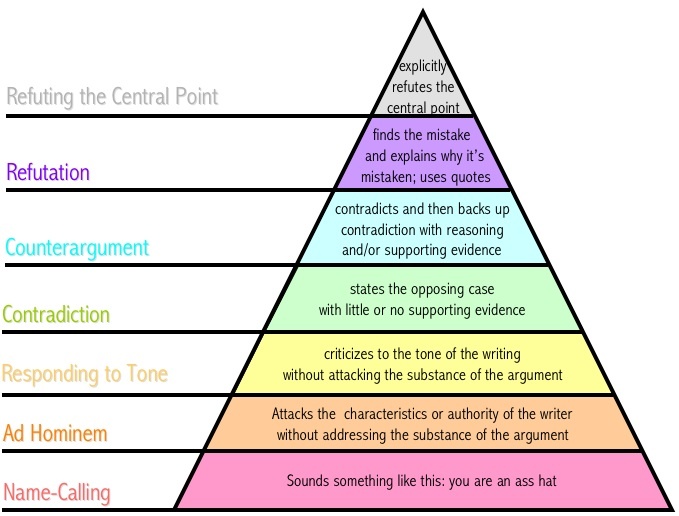 First, one should understand that name calling or avoiding to discuss the central point of your position is usually the strategy of a fool or or idiot who with no resource or substance of their own, will reduce the discussion to attacking the person rather then the argument. Ad hominem (Latin for “to the person”, short for argumentum ad hominem, is a fallacious argumentative strategy whereby genuine discussion of the topic at hand is avoided by instead attacking the character, motive, or other attribute of the person making the argument, or persons associated with the argument, rather than attacking the substance of the argument itself. The terms ad mulierem and ad feminam have been used specifically when the person receiving the criticism is female. However, its original meaning was an argument “calculated to appeal to the person addressed more than to impartial reason”. Fallacious ad hominem reasoning is categorized among informal fallacies more precisely as a genetic fallacy, a subcategory of fallacies of irrelevance. In a nutshell, busting out of the gate and calling someone a ‘hater” or ‘Looser” , or Dem, or Nazi or what ever is surely the best way to lose an argument. You might even be correct in your assertion or belief , but attacking your antagonist with an insult not only disqualifies you from the discussion but it points to the weakness of your intellect and your own character. Refute your point with logic and sound explanation of why you disagree with the point and or argument, and then proceed to explain why you feel this way and why it is you believe something else.